A year following the signing of the peace agreement, in Chocó, on Colombia's Pacific coast, the armed conflict and violations of the human rights persist. The human rights situation in the department of Chocó on Colombia's Pacific coast remains critical. Since the demobilization of the FARC in January 2017, armed groups such as the National Liberation Army (ELN) and the Gaitanista Self-Defence of Colombia (AGC) are vying for control in the territories the FARC has left. Indigenous and Afro-descendant people in the region have been the main targets of killings, attacks against human rights defenders, forced collective displacements, confinement and other human rights violations. The Colombian state must address this serious situation urgently and provide protection to the communities of Chocó. What happened in Chocó after the signing of the peace agreement? 2017 – a year of peace? For the Indigenous and Afro-descendant communities of the department of Chocó on Colombia's Pacific coast, the violence and violations of the rights to life, physical integrity and security continue, despite the 2016 Peace Agreement. Join Amnesty International and call for immediate and appropriate protection for these communities and their leaders. Since the signing of the Peace Agreement between the Colombian government and the FARC (Revolutionary Armed Forces of Colombia) guerrilla group, the human rights situation in the department of Chocó has remained critical. After demobilization, the FARC left the territories they had controlled and since then armed groups such as the National Liberation Army (ELN) and the Gaitánista Self-Defence of Colombia (AGC) have vied for control of these territories. The Colombian state has failed to effectively fulfil its obligation to protect those affected by the arrival of these armed groups. The greatest impact has been on Indigenous Peoples and the Afro-descendant communities who have suffered threats against their leaders, collective displacements, confinement and targeted killings. Mass displacement has had a damaging effect on collective territories and defenders promoting the restitution of land and processes for the return of land that was violently expropriated are at great risk. Indigenous Peoples and Afro-descendant communities and their leaders in the department of Chocó are in urgent need of protection. Develop and implement urgent measures to guarantee the protection of collective Indigenous and Afro-descendant territories in areas of armed conflict in Chocó, with primary input from consultation with community leaders and representative organizations. Provide effective and timely protection measures for Afro-descendant and Indigenous leaders in Chocó, ensuring their participation throughout the process. Press ahead urgently with implementation of the Peace Agreement, especially those articles relating to the rights of the victims of conflicts and communities. The signing of the Peace Agreement in November 2016 did not put a stop to the fighting between armed groups. Nor did it end the realignment of these groups in the area after the departure of the FARC. As a result, the forced displacement of Indigenous Peoples and Afro-descendant communities in Chocó is continuing. The living conditions of displaced people are precarious: they do not have access to emergency humanitarian aid, health care, adequate food or decent housing. In the absence of a comprehensive response from the state, many communities see no option other than to move temporarily between villages and then return to their homes without any protection. This puts them at risk of further attacks and displacement. 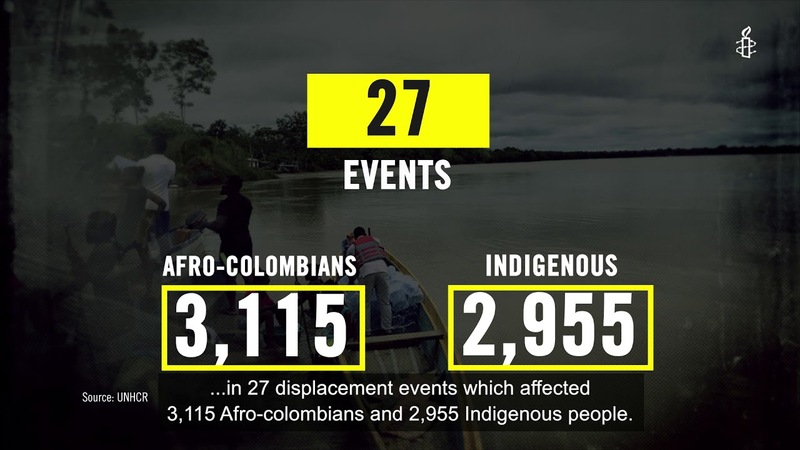 In 2017, 57% of Colombia's displaced people are in Chocó. Anti-personnel mines have exploded in Indigenous and Afro-descendant territories, injuring a considerable number of people and generating fear in communities. This fear has in some cases led to forced displacement as entire communities abandoned their lands to escape this threat. In other cases, the presence of mines has led to the confinement of communities. Communities fear going out of their territories, leaving them isolated in conflict zones facing serious food and health insecurity. The confinements reported in the Chocó mainly affect Indigenous reserves. The Colombian state has failed to provide timely and effective protection for the communities hardest hit by the armed conflict is a direct cause of the ongoing human rights violations against Indigenous and Afro-descendant people in Chocó. Reality seems to have outstripped the measures put in place by the state to deal with the upsurge in conflict. The protection measures currently implemented by the National Protection Unit face several challenges because of the growing number of human rights defenders killed in 2017, after the signing of the Peace Agreement. The violence is having a dramatic impact in the department. The Colombian authorities must take urgent prevention measures and ensure comprehensive protection that guarantees human rights, in accordance with the international standards regarding reparation and non-repetition. This is essential in order to build peace on the ground. These individual and collective measures should be formulated with the participation of the individuals and communities affected, in recognition of the centrality of victims to the implementation of the Peace Agreement.